I have been invited to fish for some Brook Trout this coming April and I have no idea what to use to catch Brook Trout in a lake???? What type and colour of lures should I use? What depth would they be at in a lake? Should I drift or troll? only way to fish for brookies is with a predator mouse on a fly rod!!!! Does anybody recomend the Mepps Black Furry #1 or 2 or something similar tipped with a half worm? perhaps some of those power bait trout attractant little rubber ball things. Also I have had luck with a little thing called a "wedding band". basically this invloves about 4 or 5 green, blue, orange or red beadswith a single bait holder hook at the one end and a silver spoon at the other. the actual "weddingband" model has some shiney fake diamond in the middle of the beads. Again i'd tip with with worms or power bait. This worked really well for rainbows and suckers up some mountain creeks in B.C. I have no experience going for specs but I've caught rainbows and browns in rivers with the above mentioned set-ups. Early season brookies are a lot of fun, just make sure they are open in your neck of the woods. Here are a few links to articles. Rapala Count Downs 3's or 5's was the advice I got from DanC a bit ago and they work great. Another lure for casting of trolling are the EBG Black & Gold with the red dots. In april bring along a fly rod if you have one and use streamers, muddlers or any baitfish type fly. I have a trailer just outside the park and fish for Brookies every May and September . 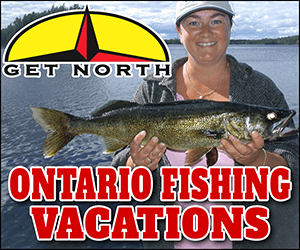 The fastest way to cover water is by trolling if the lake allows motors (you should check that to make sure also ) We have your best luck trolling Panther Martins #6 1/4 oz. colors Yellow/Orange & Geen/Yellow or Blue Fox Vibrax # 3 1/4 oz. in Gold or Red/White around 50 feet back . This targets a depth of around 12 to 18 ft. As you are not allowed to use bait fish in the park we tip these lures with Berkley gulp minnows 3" silver just to give it alittle action . Most fish in the spring seem to be in the 10 to 20 Foot of water range this includes Lake Trout . If you are canoeing, casting these same lures into shore and retreiving will also catch hungry Brookies . Target dead fall and boulders in the water and cast to either side and be ready to set the hook they hit like freight trains ! If by chance there has been a fly hatch Muddler Minnows in either light brown or black work very well No fly rod you say I don't have one either I just tie one on my spinning gear and give it a spray of dry fly juice and troll it behind the boat. Mice also seem to work well in very close using the same technic . That was a great link from Guido, OOD, and Gord Pyzer. I am going to be targeting brookies (specks as the old guys say) on the N shore of Superior about 100 mi west of Wawa at the end of May. I will be working all these suggestions, with thanks to all. I'm going to be targeting brookies (specks as the old guys say) on the N shore of Superior about 100 mi west of Wawa at the end of May. And I know exactly what works in that particular body of water as well as where they can be found. Truly beautiful country up there Doug, even if the fishing is poor it really doesn't matter, the scenery is breathtaking. Sounds like a great reason to get out fishing together, with gas and gweeches on me, Mike. First of all, my apologies HUKDONFAWNIX. I fully intended to reply to your pm, but have been very busy both at home and at work lately. You have been given lots of suggestions in the above posts, and they are all good choices. An important thing to consider is the depth that the Brookies might be in at the time that you're going. That will also determine the type of lure to be used. I don't fly fish, so all of these are spinning gear patterns. The closer to ice out, the shallower that they'll be. As Guidofisherman said, look in water as shallow as 1 foot, or even less sometimes. In this case, Countdown Rapalas are a great choice. Size 3 or 5 will do, unless you are expecting fish over 20 inches, in which case a size 7 or even a 9 will work. I've used and caught them in many different color patterns. Perhaps the orange and gold is my favorite because I can see it easily in the water and watch for follow ups. By the way, figure eighting works great for Brookies if one follows you right to the boat. In deeper water I like to use the local favorite up here, the jig fly. These aren't commercially made, but I can put you in touch with a few guys that make or sell them. They're basically a colorful streamer on a lead head jig. Also as mentioned, if you can put together a Muddler pattern on a jig, that's probably my top choice overall. 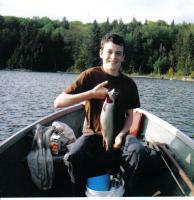 I have not used any type of live or organic bait for Brook Trout in well over a decade. A few other things. Bring a thermometer and sample the water temps in a few different locations. If the ice has recently come off the lake, chances are that it will all be under 50f or so. If you can find a sunny shoreline that is a few degrees higher than that, work that area extensively. If by chance the water is warmer than that, say in the mid to high 60's, do the opposite. Look for cooler water. 55f to 60f is prime. Trolling or casting are both effective. Usually my partner casts into the shallows while I troll and run the boat. Some days he pulls them out of the shallows and other days I get more in the deeper water. Wear polarized glasses and keep your eyes open. I always hear how spooky Brook Trout are and how you have to be in stealth mode or you won't catch them. I haven't found this to be true. I've caught countless fish by sight fishing a few feet from the boat. Or I troll right over them and catch them when the lure reaches them. A few times I've been lucky enough to get right on top of a school of fish and pick which one that I want to catch. Or course there's also been times when I couldn't pull a fish out of a school if my life depended on it. Bottom line, wear your glasses and keep looking. I hope this helps a little. Have a great trip HUKDONFAWNIX. I'm looking forward to your report already.. Thanks guys for all of your help. Lots of good info! I will be using a spinning rod/reel set up. What size spinners are the ideal size? And if I use a hook and some split shots...what size hook? I truly appreciate all of your replies! No worries at all. Thank you for taking the time to post your expertise. This board is such an amazing source of information. A lot of great people on this site and I'm happy to be a part of it. I'm late on responding, but yay brook trout are my fave with fly fishing! i'm not good with fly names, but in late april when the season opens i usually use these small white/light grey (kind of fluffy) flies, or adam's fly is classic as well as one that looks like an adam fly but has a red shiny band around it.. you can usually see the bugs they're eating off the surface and try to match them if you can. Good luck and make sure you post about it afterwards! For trolling, don't forget about using a spoon/fly combo. A streamer - bugger, muddler, hairwing... - 12" behind a spoon will often increase your hook-ups. The plug that I have had great luck with is the Pins Minnow...probably no better than a Rap, but I like them. In lakes, I find brookies very location specific. Sometimes they are in open water, other times you have to be casting right onto shore to get them. We had a day last year that they were gorging on salamanders. If you didn't get your spinner within 6" of shore, you weren't catching fish.